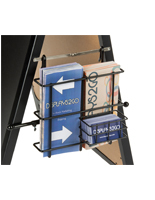 These folding A-frame displays are a great way to advertise your services, clearance sales, or special items right by the sidewalk where passersby are sure to see them. The sandwich boards are made of lightweight aluminum so they are portable units that can be brought in at night. 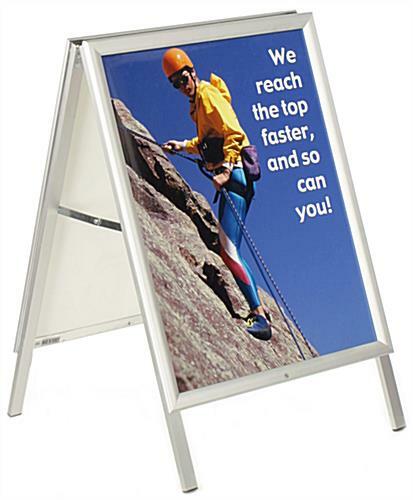 The A-frame displays with PVC lenses are resistant to water and can be left out in light rain. 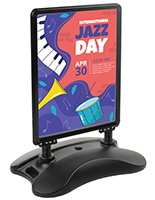 The plastic covers also help to reduce the glare that might be present on your sidewalk signs. 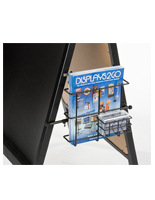 The displays use snap open sides to help keep the time it takes to change images to a minimum. 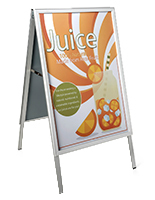 The sandwich boards hold 22” x 28” posters and are easily seen at a distance making them great portable signs for businesses in strip malls. 23.8" x 35.5" x 26.3"